How to Roast Garlic (Oven Roasted Garlic) - VIDEO!!! HOW TO ROAST GARLIC. I absolutely love Oven Roasted Garlic. It is a surprisingly easy and delicious way to make your kitchen feel like an upscale restaurant! The bold flavor of freshly Roasted Garlic is just so goooood and I can’t get enough of the aroma either. I love eating it with pasta, steak, or anything that needs an extra kick. And it’s such an easy thing to do! 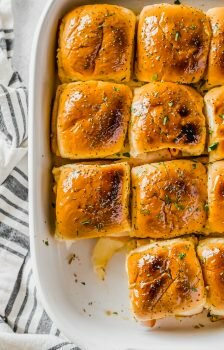 Oven Roasted Garlic is SO good and so easy to make. I’m going to show you how to roast garlic so you can try it too! I’m teaching you How to Roast Garlic because it’s been kind of a revelation for me, and I hope it is for you too. Every year for Valentine’s Day, Pat and I try out a new swanky steak restaurant. It’s my absolute favorite meal (the juicy filet, the hearty sides, all the wine!) and it’s definitely fun to splurge too. I look forward to it all year! This year I’m trying to recreate my favorite meal at home. Any self-respecting food blogger would at least try, right? I posted my favorite recipe for EASY (and totally delicious) Restaurant Style Steak, but today…today we are talking garlic. My new obsession: Oven Roasted Garlic. You HAVE to try this. The flavor of roasting garlic is intensified and a little bit sweet. I can’t get enough of it! It is such a great thing to eat along with steak, and of course it tastes amazing with pasta and all kinds of other foods too! You won’t believe the incredible flavor of Oven Roasted Garlic! Learn How to Roast Garlic and start adding it to all of your dishes. I have always been a fan of garlic, but I had NO idea how to roast garlic like this. I didn’t even know it was a thing. 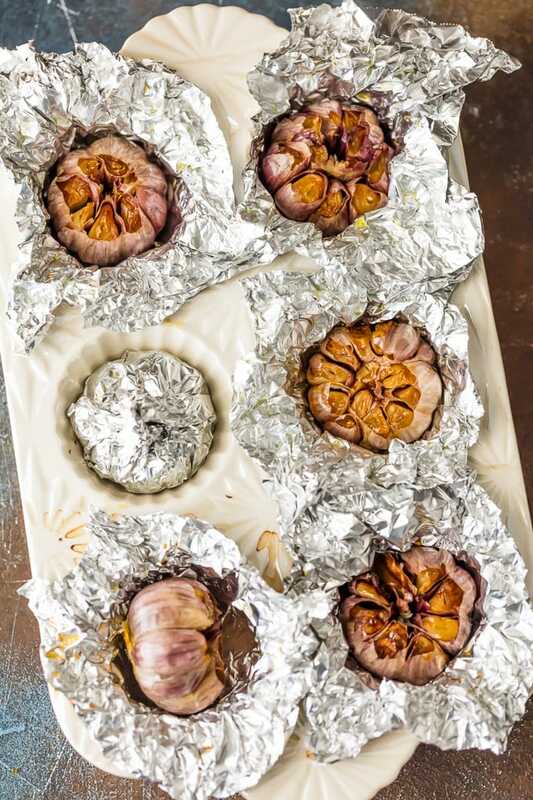 We first had Oven Roasted Garlic like this at one of our favorite Valentine’s destinations last year, and I’ve been wanting to make it ever since. This Roasted Garlic tastes just like it did at the expensive restaurant, but I made in minutes at home. It’s delicious with the steak, but it’s also surprisingly tasty eaten on its own! Roasting the garlic really brings out its sweet flavors in the most perfect way. Like I said, you have to try it! 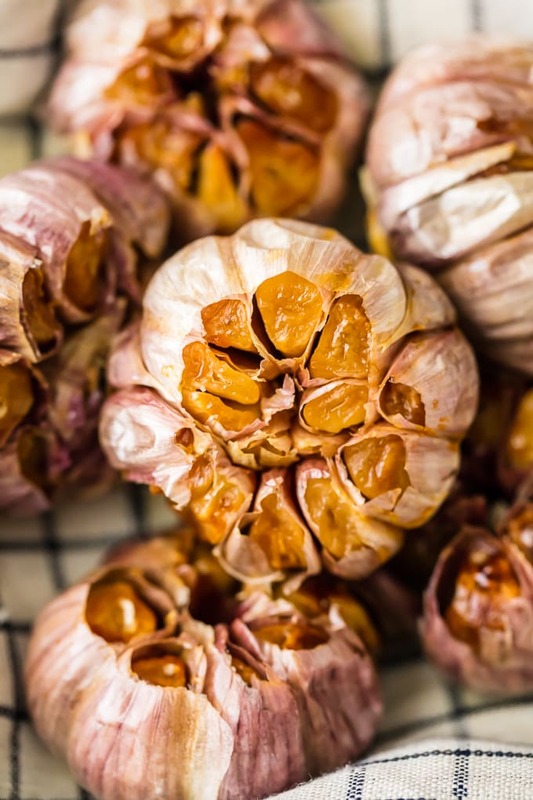 How do you roast whole garlic bulbs? 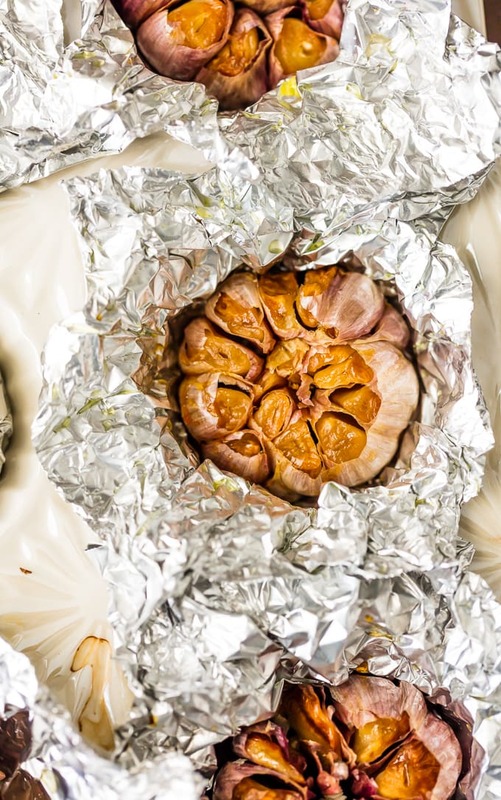 To make this oven roasted garlic, you’ll be roasting whole garlic bulbs. It’s a simple (and tasty) way to cook garlic. So if you don’t know how to roast garlic, don’t worry, it won’t take much work! Now your oven roasted garlic is ready to enjoy! Roasting garlic in the oven takes about 35-40 minutes. It needs that time to really let the flavors come out and your kitchen will be smelling amazing the entire time! Is a clove of garlic the whole bulb? No. Garlic Cloves and Garlic Bulbs are not the same. It’s important to know the right terms when cooking, otherwise you might end up with WAY too much garlic in your dish. A garlic bulb is also known as a head of garlic. That’s what we’re using in this roasted garlic recipe. It’s the ENTIRE thing. Whereas a garlic CLOVE is the individual little pieces of garlic you get when you peel and pull apart the bulb. So a head of garlic contains many cloves of garlic. What do you do with roasted garlic? Oh the possibilities! 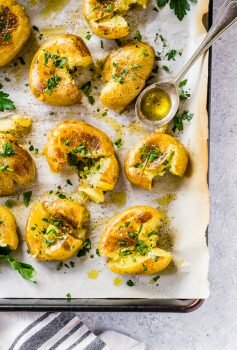 This oven roasted garlic recipe actually makes for an awesome (and unexpected) side dish that goes well with all kinds of meals. Like I said earlier, I made this to go along with steak, and I think that’s one of the best things to pair it with. But I’d just as quickly eat this along with an easy chicken recipe (like this Spinach Stuffed Chicken Breast) or a pork dish (like this Pork Tenderloin recipe). And of course it would be perfect with any Italian pasta dish too. 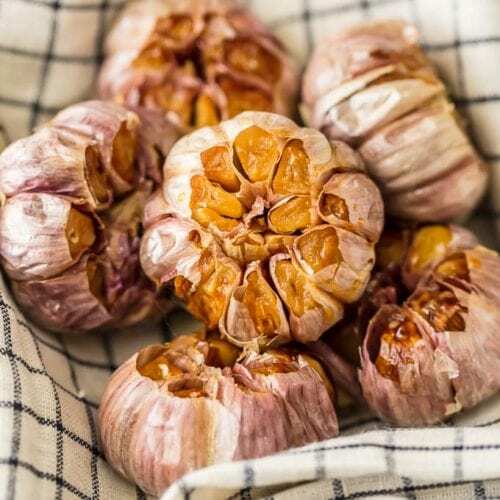 Now that you know how to roast garlic, you could add the cloves to a bowl of savory soup, mash them up with mashed potatoes, or make roasted garlic anything. 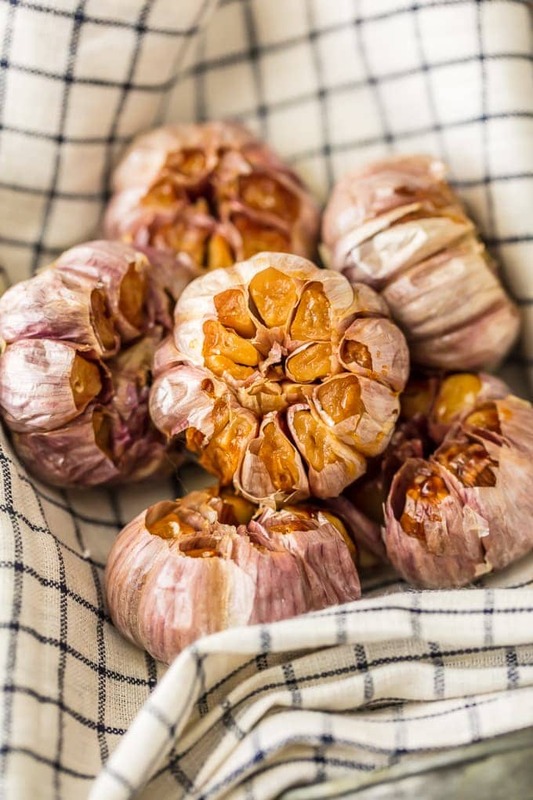 Once you learn how to roast garlic, you’ll want to make it for each and every homemade meal! We especially love it with our favorite Stovetop Steak, Buttermilk Fried Chicken, or Garlic Parmesan Pork Chops. YUM! Now that you know How to Roast Garlic, you’ll be making this roasted garlic recipe all the time! 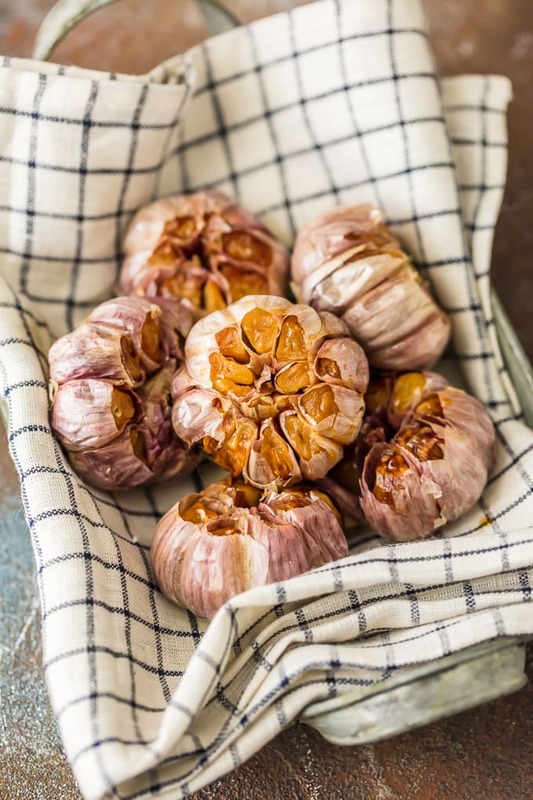 Whether you’re having a dinner party, or just cooking for your love this Valentine’s Day, Oven Roasted Garlic is the perfect compliment to any classy meal! See the recipe cared below for full instructions on How to Roast Garlic. Enjoy! HOW TO ROAST GARLIC. I absolutely love Oven Roasted Garlic. It is a surprisingly easy and delicious way to make your kitchen feel like an upscale restaurant! The bold flavor of freshly Roasted Garlic is just so goooood and I can't get enough of the aroma either. I love eating it with pasta, steak, or anything that needs an extra kick. And it's such an easy thing to do! Taking a sharp knive, cut the top of each garlic bulb straight off, about 1/2 inch down from the top. This should cut into most of the cloves to expose the interior. Top each bulb with 1/4 tablespoon and massage into the cut side of each bulb. Wrap each bulb in tin foil and place into the cups of a muffin pan, cut side up. Bake for 35-40 minutes or until each clove is tender. To eat, pinch from the outside and the clove should come easily out of the skin. Enjoy! Roasted garlic is so wonderful with dinner and your dinner looks incredible. Those are great pictures! Going to bake some! I love roasted garlic with steak and in salads! Roasted garlic is also great spread on some crostini bread slices with some chopped tomatoes. Omg I love that idea. Must try!